Click on each area highlighted below to view the unit plans. The First Floor consists of five bedsitter apartments, one 1 bedroom apartment and a frail care area all ensuite. Residents can select for the shower to be replaced with a bath. The bedsitter apartments are designed for both short and long term recuperative care, as well as permanent frail care. This facility will be staffed 24 hours a day by trained nursing personnel, under the supervision of a qualified sister. 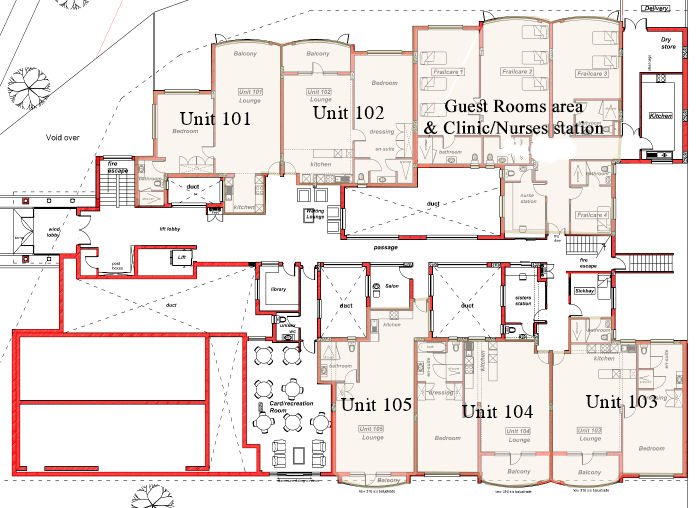 The floor is designed so that both the Nurses station and live-in nursing sister's quarters are situated adjascent to the frail care units. The frail care facility has its own kitchen facility for the preparation of meals for frail care residents. Each apartment will be fitted with an intercom, which will enable the resident to contact the sister in the case of an emergency. The first floor also has a residents’ lounge/card room with a library. There is also a hairdressing facility.